Kildare is open for business! Today saw the launch of my Kildare Business Wisdom Council initiative in Johnson’s, Newbridge, the goal of which, is to share the business skillsets we have in Kildare to the betterment of the community as a whole. The community will benefit overall from the nurturing of business by businesses within the community. Businesses with more experience help those with lesser experience. An accountant for example could donate an hour a week/ or a month to a business/es. In turn a marketing person could donate an hour of their marketing experience. 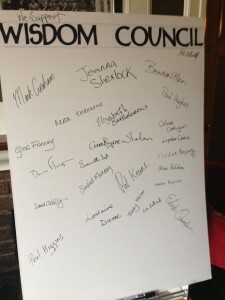 This initiative is based on the idea of a “Wisdom Council” where business people become like a Board of Directors for each other but without the fees. I came up with this idea when trying to figure out how to help people I was meeting on my canvass who were looking for support to get their businesses kick-started or growing again. I have a Wisdom Council for my own business where a group of peers, friends in business come together on a regular basis to give the benefit of their varying perspectives and benefits to each others businesses. 1.Anyone can submit a request for help as part of the initiative, any business can opt to donate time. 2.People requesting time do not have to be a member of any business network. 3.Chamber or business network members donating their time may advise at which point they feel the person receiving their time would benefit from signing up to Chamber or other business Networks. 4.Where demand outstrips supply the Patrons of the Wisdom Council will identify where and when resources might best be allocated.